Ever wanted to have your own arcade on your PC or Laptop? Now you can with H+Soft Arcade! 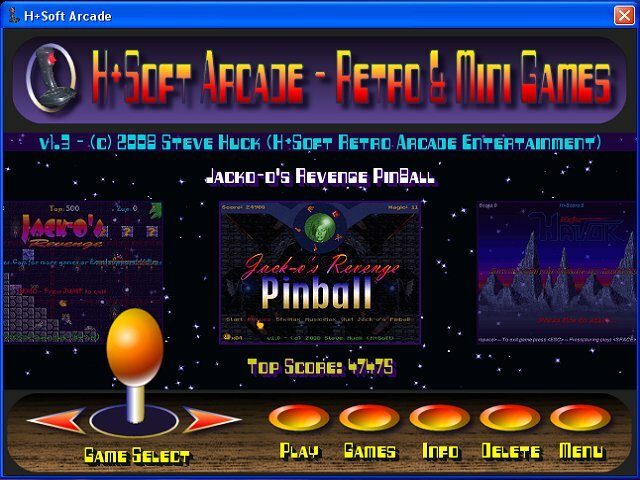 - Play, Download, Get Info or Delete any game from the H+Soft collection of Retro Style and Mini games with a simple mouse click! With several games available and new games in development, H+Soft Arcade is definately worth checking out! Version 1.3 Includes popular platform game Jack-o's Revenge v1.11 already Installed - An evil witch has turned you into a Jack-o-Lantern! Now you must survive her castle for the five magic items to reverse her spell! Latest game released for H+Soft Arcade is Jack-o's Pinball v1.0 - Help Jack-o find the five magic items while bouncing and bashing around a crazy pinball setup!